Ce magnifique, rustique et impeccablement entretenu maison en bois rond située dans un cadre privé du développement Châtaigne Valley Golf Club est vraiment à couper le souffle. Il allie une élégante salle avec le royaume des grands espaces. Vous pouvez vivre dans tout le confort que le luxe offre, et passer toute la semaine recherchant une vaste gamme d'activités et d'excursions en plein air pour tous les âges. Un rendez-vous loin parfait pour la famille, les amis, les filles / mecs voyage, ou même un «petit» retrouvailles. Il est idéalement situé à Harbor Springs, Petoskey, Pellston, Burt, Crooked, Mullet Lacs avec le système sentiers de motoneige Michigan. Cette maison est vraiment la quintessence de Northern Michigan maison de rêve et vous êtes assuré de créer des souvenirs qui dureront toute une vie. Ne attendez pas, la disponibilité est limitée, réservez vos dates de vacances AUJOURD'HUI !!! Beautiful house and a wonderful location!!! It's vintage Northern Michigan. 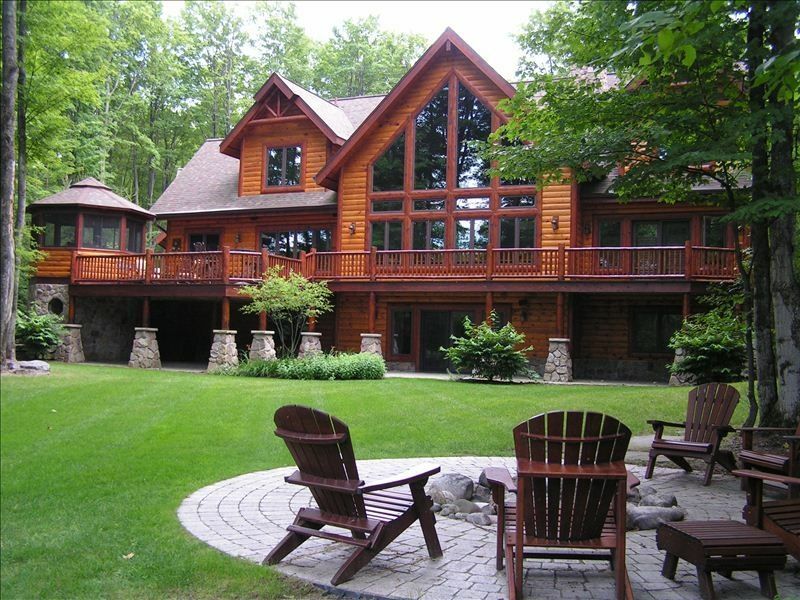 Beautiful sprawling log home. We had a fire at night. Enjoyed some ping pong. Super accommodations. Whatever you need, its there. Beds are comfy. Sound system is incredible. Fridge wasn't working, but they had a couple back ups. We didn't get to enjoy the jacuzzi, but maybe next time. The golf course is wonderful as well. Truly a Remarkable Retreat! We will definitely return. Beautiful infrastructure for our large group, but the property is not well maintained. There was garbage under the couch cushions for example. The game room is fantastic, but every game had something wrong with it- the pool balls fall out of one pocket, one air hockey goal is taped on, the timer does not work for the basketball game etc. The door handle was literally laying on the ground outside for the downstairs door to go out. Beautiful house, beautiful grounds, but could definately use some tlc. Thank you for the feedback. We are always looking for ways to improve the property for future renters. We will certainly look into these items and address as needed. it had a cabin feel in the woods, very spacious home and property. All was in good working order except the internet which was so slow it was unusable. Myself and others had planned on working in the mornings, couldn't because of the lack of speed. We reset the modem and router and the local property person did contact the provider- no luck. Overall a good choice for us. Had a big group of guys for a golf trip and this place exceeded all of our expectations! We used the rental to celebrate our grandmother's 90th birthday. The house and location was great, it was absolutely beautiful. There was plenty of room for our grandmother to rest and join the family when ready. It was great for family members of all ages. We loved this vacation spot. The only negative was that the grounds keeper or person leaving the keys did not walk through the house with us to let us know how everything works and to make sure there was no damage from the previous guests. Our immediate family just spent 4 perfect days at this home. The floor plan and charm of this home really is incomparable. Space to read and relax, space to gather together and share meals and time talking. The game room was great for cards, pool and just plain fun. The proximity to Boyne Highlands, Harbor Springs and Petoskey allowed us to access some of the truly great family recreational activities. Skiing, tubing, winter rafting, and the movies are all a short drive away. Don't hesitate to book your vacation here.